"When we reach out to communities who are underserved, we bring possibilities to those who may never have dreamed about or seen dance as art. They are given a chance to consider a different perspective and perhaps develop an aesthetic. Arts education is a transformative experience." Community Arts Partnerships (CAP) engage and enrich communities by providing exploratory learning experiences of Latino cultures in New York City and around the world. CAP includes in and after-school dance residencies that unite teaching artists with the school community, interactive performances featuring our second company, BHdos, or our main Company, classroom workshops, and master classes with Ballet Hispánico’s Company members. Our CAP programs extend beyond the New York City area via our Company, which shares our commitment to cultural engagement and arts education to communities internationally. While on tour, the Company offers residencies that are individually tailored to expose students to arts learning, to support a cultural dialogue in the community, and to share the power of dance with local educators and organizations. CAP has transformed the lives of thousands of people in Chicago, Houston, Los Angeles, Miami, New Orleans, and more. The CAP menu of activities in New York City offers in and after-school arts and education residencies, workshops in dance forms from Spain and Latin America, interactive performances by our teaching artists, and excerpts of Ballet Hispánico’s repertory in our Performances for Young People (PYP). The contrast of dance styles and genres within our CAP program will allow the students to widen their perspectives of dance and culture while celebrating the rich diversity in our community’s heritage. CAP brings the enjoyment of Latino dance traditions to nearly 19,000 children and family members nationwide. The CAP program tailors residency content for each school, providing custom-designed programs that embrace Ballet Hispánico’s pedagogical standards, goals, and philosophy, and matches each school with an outstanding teaching artist who is invested in developing our community’s cultural and educational talents. Our program draws from the New York City Department of Education’s Blueprint for Teaching and Learning in the Arts: Dance Grades PreK-12, addressing five strands of Learning in Dance. Learn more here. CAP workshops can be a single class or a short series of dance classes tailored for each school’s needs. Our workshops focus on traditional, social, fusion, or folk dances from Spain and Latin America, such as flamenco, salsa, merengue, or tango, but can include theatrical dance forms as well, such as ballet or modern dance. Performances for Young People (PYPs) take audiences on a guided journey through Latin-American dance and music. This interactive, fun-filled exploration features excerpts of the Ballet Hispánico repertory and is narrated by one of our master teaching artists and performed by our second company BHdos, or our main Company. Latin music and cultural connections, choreography insights, and dance history come together to deepen the audience’s experience of dance. Students are exposed to world-class choreographers and the cultures of Spain, Cuba, Puerto Rico, and the Americas, while learning about Latino icons such as Celia Cruz and Tito Puente. 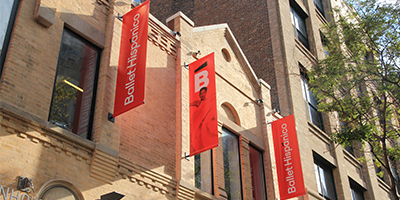 Ballet Hispánico's Community Arts Partnerships program is supported, in part, by Ford Foundation, Open Society Foundations and the Fund for the City of New York, The Hearst Foundations, Louise and Ardé Bulova Fund, Con Edison, Burke & Company, Goldie Anna Charitable Trust, The Bay and Paul Foundations, May and Samuel Rudin Family Foundation Inc., and by public funds from the National Endowment for the Arts, the New York State Council on the Arts, a state agency, and the New York City Department of Cultural Affairs in partnership with the City Council.